Stocks Continue A Winning Streak; Dow Industrials Now Over 25,000 : The Two-Way Stocks have been rising for years, and they are starting 2018 with another shot upward. The Dow Jones industrial average closed at about 25,000 — the fastest run to a new 1,000-point milestone ever. 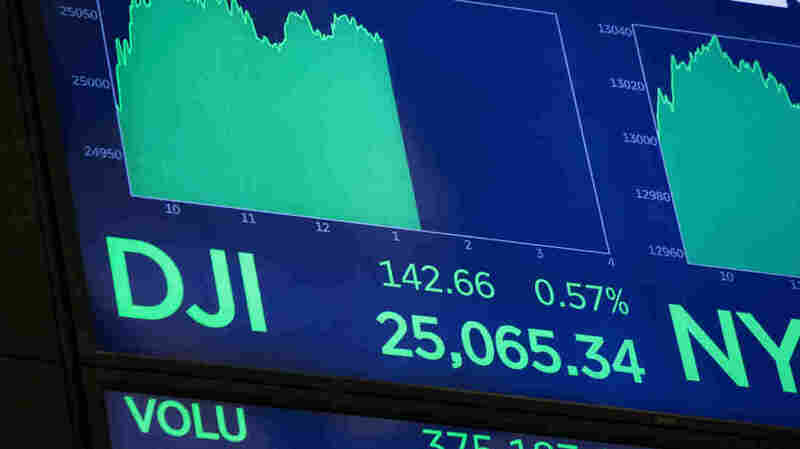 The Dow Jones industrial average closed above 25,000 Thursday for the first time. The Dow Jones industrial average finished above 25,000 for the first time, as the long rally in stock prices showed no signs of letting up. A strong report about hiring from payroll processor ADP helped push stocks higher. Financial stocks did especially well, and an increase in oil prices has benefited the energy sector. The Dow finished the day at 25,075, a gain of 0.61 percent. Both the Nasdaq composite index and the Standard and Poor's 500 index also finished at record highs. Last year turned out to be the best for the market since 2013, with the Dow climbing more than 25 percent. It rose 4,000 points over the last 10 months. "It was the first year in history where you saw every single month up," said Liz Ann Sonders, chief investment strategist at Charles Schwab. Sonders attributes much of the surge in prices to broad economic factors, including low interest rates and healthy growth. "I think the turn in earnings and the strength in global growth was enough to propel the market, and then the longer-term story has been just massive liquidity, courtesy of the central banks," she added. The Federal Reserve and other central banks for years funneled extra money into the economy through a process known as quantitative easing, to stimulate growth. They have also kept interest rates low, although lately they have begun to reverse course. Jeremy Siegel, professor of finance at the University of Pennsylvania's Wharton School, says the expectation of a large corporate tax cut and deregulatory efforts by the Trump administration probably played a part in last year's rally. Four days into the New Year, prices have continued to barrel ahead. Earlier this week, the Nasdaq composite index finished above 7,000 for the first time, and the broader Standard and Poor's 500 index also set a record. But no rally lasts forever, and the prospect of higher interest rates could put the brakes on this one. "We think the economy will be a little bit stronger, juiced a little bit by tax cuts, but we are getting later on in that cycle. Maybe we're in the eighth inning or so," said Paul Christopher, head of global market strategy at Wells Fargo Investment Institute. A previous version of this story said the Dow rose 4,000 points over the last four months. It rose by that amount over the last 10 months.